One of the best parts about working at a bead store is meeting local beaders! Every day introduces us to new artists and projects. After getting to know Bead Bazaar regular Megan Lee, we discovered that she sells her jewelery at multiple Bellingham shops. 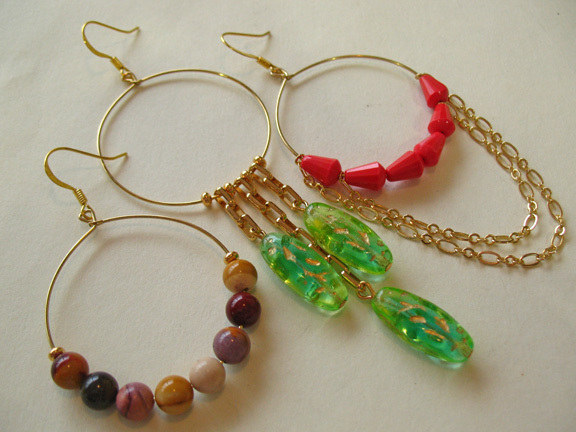 Megan Lee has a Facebook page featuring her designs, and her earrings can be found at Sojourn, Serendipity, Keiko Keiko, and Labels. We love Megan’s hip style and business savvy, so after receiving some funky new Czech glass (one of her favorite materials! 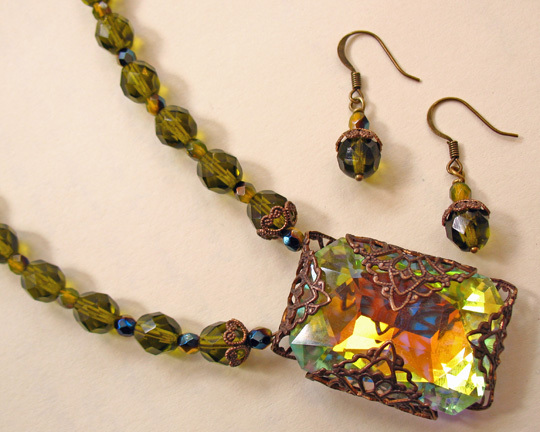 ), the Bead Bazaar decided to do a special featuring Megan Lee Designs. We also asked her to make a guest sample for the store! Read on for more information and inspiration from one of Bellingham’s artists. A: Since I was 5. I still have the very first necklace I made as a little girl; I carry it around in my car. My dad helped me make it. We drilled holes in foreign coins, and hung them with a fishing lure on leather. 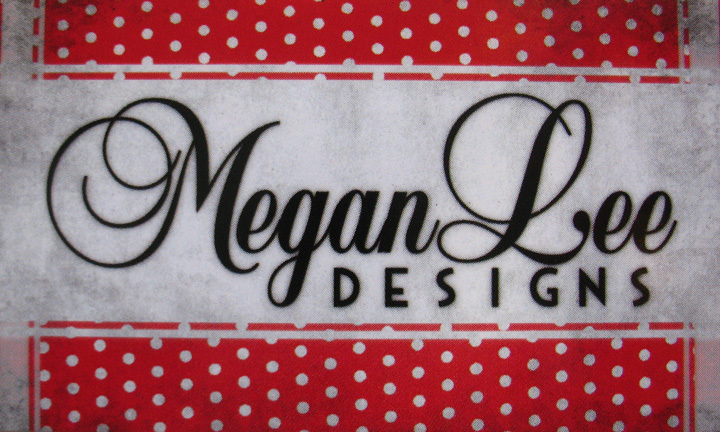 Q: How did Megan Lee Designs get started? A: I have been selling since I was 15. I was one of the original makers of guitar pick earrings, which sold really well and became very popular. I originally sold them at Passionfly, now the Black Market Boutique. It’s one of the first stores I sold jewelry at and it has just progressed since then. News about my jewelry spread a lot through word of mouth. My jewelry used to be sold in 11 different stores in Bellingham. Q: How did you decide on the name of your jewelry line? A: I wanted my name in my business. Since I come up with all my own designs, I just thought it would be nice keep it simple. I have a graphic designer who designed the logo on my earring cards. Right now it’s a pair of eyes; their blue color was taken from a picture of my own eyes! I’m planning on changing my logo to something more vintage Western inspired- stay tuned to see the results! A: Urban chic, but I also try to keep up with current trends. I’ll look at the trends and infuse my own style into them for my designs. Being aware of what’s popular opens you up to new ideas. I’ve grown to like new things this way- I used to avoid gold, but now I love it. Q. What materials are your favorites to work with? A. Glass, vintage acrylic, resin, metal and chain. I like to use vintage components from estate sales and antique stores, taking them apart and redesigning with the components. I don’t work with stone as frequently because I like to keep my price points low. A: I have days when I want to really dedicate my time, have a strong inner motivation to make jewelry. Having as many people who like my work as I do is something I never imagined. It’s an inspiration to see pieces I remember making on the people who wear it. Coming to the bead store also inspires me! A: Girl nights! My friends and I will do crafts and drink wine together. We’ll share ideas and designs with each other. My friends’ styles mesh well with mine, so we’ll collaborate on designs. A: I start organizing all my beads (I store beads in stacked muffin pans). Reorganizing reminds me of what I have to work with and inspires me. Or I call a friend or use my own clothing to inspire me to make something. A: I love the outdoors, paddle boarding and biking and swimming in the summer. My other biggest talent is cooking. I love food, whether eating out and cooking. I’m a food connoisseur. I also work 3 jobs, which keeps me pretty busy. Q: Do you have any hopes or ambitions for ML Designs in the future? A: I just want to continue what I’m doing. It’s a life-long hobby that’s turned into a small career, and I don’t want to push it, I want it to naturally progress. I’m happy and content with where it’s heading now. Thank you, Megan, for sharing your creativity with us! Want to see more of her work? Make sure to stop by her Facebook page or one of the many stores that sell her jewelry. We’re so proud of our Bellingham Artists, and want to thank Megan Lee for allowing us to interview her. Happy Beading!